Jamaica has three major cruise destinations including Montego Bay, Ocho Rios and Port Antonio. 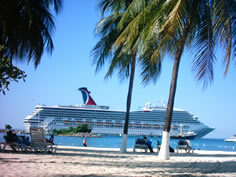 Jamaica is a popular all year round cruise destination. Approximately half of the Caribbean's two million annual cruise travelers visit the island of Jamaica to enjoy the beautiful beaches and warm weather. 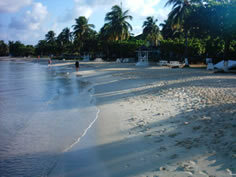 Many of Jamaica's visitors fall in love and return to the island for a longer stay. We are here to make your tropical island wedding come true. Our wedding packages are simple, affordable and tailored to your specific needs. We have created a special wedding package for sailing couples that are arriving by cruise ship. Our famous white sand beaches, sparkling waterfalls, majestic mountains and beautiful gardens create a magical settings in which to celebrate your special occasion. Planning your own wedding can be very stressful, filled with headaches, unwelcome surprises, stress and sometimes disappointment. Our wedding arrangement services cater for intimate gathering for a few close friends and family or a large wedding celebration with multiple attendants and an extended guest list. Intimate destination weddings are our specialty. Imagine your wedding day on a beach at sunset with the soft white sand under your feet and those closest to you sharing your special moment. Why not get married in a beautiful tropical garden setting with luscious hibiscus plants and tropical flowers all around. You can also choose to exchanging vows under a palm, with lush vegetation of the mountain forming the back drop and looking out across the turquoise Caribbean Sea. 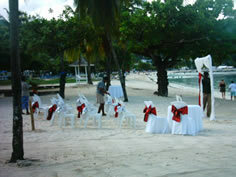 We have several wedding venues that will cater for your dream Jamaica Wedding. Say "I do" in the shade of a palm tree at the beach or surrounded by tropical flowers in famous tropical gardens wedding, beautiful historic homes wedding, romantic waterfall wedding, beach wedding and tropical botonical garden weddings. We process all marriage license prior to your arrival in Jamaica, so you just show up and get married and have the rest of your day to enjoy our beautiful Island. Certified Original Copies of Birth Certificate for bride and groom. Proof of Divorce (where applicable) - Certified Original Copies of Certificate of Divorce. Certified Original Copies of Death Certificate in the case of widow/widower. Certified Original Copies of Adoption documents reflecting name change (where applicable).